How to create a checkbox field in FileMaker Pro. 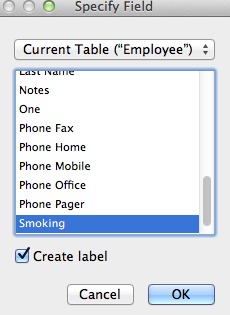 For some odd reason, FileMaker Pro does not have a “native” boolean checkbox field. Instead of simply dropping a simple checkbox on to a form (called a layout…in FM Pro), you have to strictly follow a roundabout procedure to what is a dodle in virtually all other development systems. 2. Go to Manage Databases. In your data table, define the field name for the checkbox field. OK….so now the table fields have been defined, and lookup value has been defined. Now, what remains is displaying the field in your layout. 5. Adjust the size of the field to cover up the “1” which makes the field look normal. I’d appreciate comments and corrections from the FM experts. This entry was posted in Uncategorized on September 30, 2011 by lkeyes70. Thanks for this tutorial. It seems so simple when you outline the steps this easy. Tried all morning to find a solution for check-boxes, but this was the first that made sense. By using a value list the field defined turns true for ALL records if selected for any record. At least that's what happened to me? Great tip for a checkbox since the tutorial addresses exactly what I wanted to do but the value has to be segregated to individual records. hmm…not sure…. do you have a global or local variable floating around of the same name that is assigned to the field? Then, be SURE to uncheck “Do not evaluate if all referenced fields are empty” because you do want it to evaluate when empty (that's the whole point *grin*). Vic: It does sound like you have that field defined as a Global (look under Manage Database, Options, Storage – global should be unchecked if want a different value for each record). Just an FYI – FMPro, in the context of number fields, will recognize the text values of “Yes” and “True” as equal to 1, and the text values of “No” and “False” as 0, in case it's easier to mentally parse yes/no or true/false rather than 1/0. I tried this on Filemaker 15 and Daniel’s solution works well, but note that you get an error message when checking the box if you set the validation option of the boolean field to “strict numeric only”. 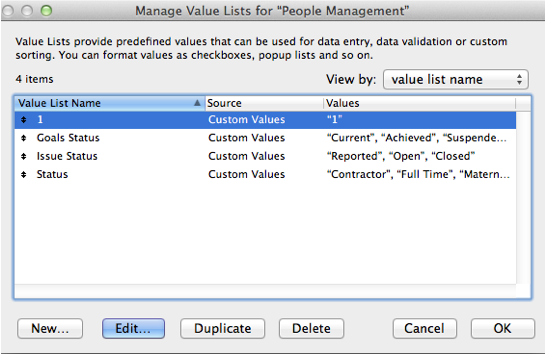 It seems Filemaker treats the value from the value list “1” as text. The solution is simply not to check the validation option ‘strict numeric only’. Provided you do this, it is OK to define the field as a number field; it does not have to be text.